7 v. : ; 28 cm. 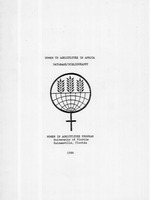 "A selected bibliography focusing on women in agricultural production; farming systems research and extension; gender issues and intra-household dynamics; and women in agricultural development. Also available on computer disk for use with the PFS; File Program." prepared by Jean Gearing with assistance from Dan Reboussin ... [et al.] ; supervised by Anita Spring. .. ..... ..... ...... .
. .. .... ...... .
.. .. .... ... .... .